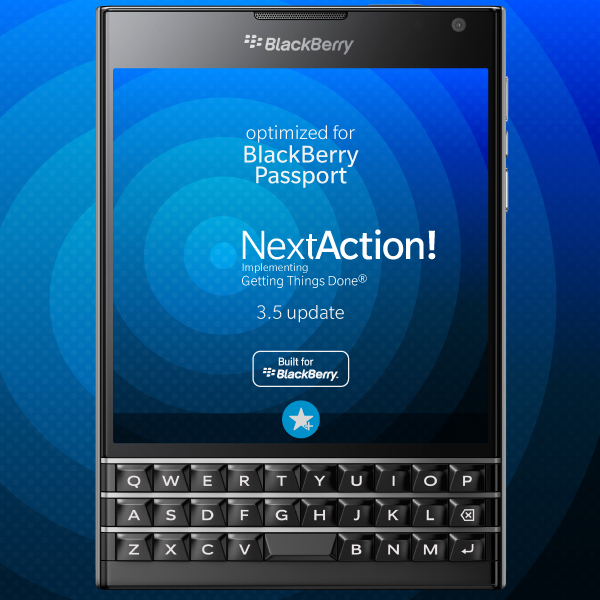 S4BB Limited has updated NextAction! with full support for the BlackBerry Passport. The new version is now available on BlackBerry World for its usual price of $9.99 for an unlimited license. The BlackBerry Passport with its massive 1440×1440 display provides a lot of space for implementing David Allen’s methodology of Getting Things Done®. Accompanied by useful and beautiful signature actions the Built for BlackBerry-certified NextAction! takes full advantage of the new features in the BlackBerry Passport with the BlackBerry 10.3 OS. NextAction! is purely built for David Allen’s Getting Things Done® (GTD®) methodology, the groundbreaking work-life management system.